I have realized that I haven’t given nearly enough importance to food as I should have. Let me remedy this now. Please note that, sadly, none of the pictures on this page are mine, since I didn’t think to actually photography what I ate. Beginner mistake, I know. 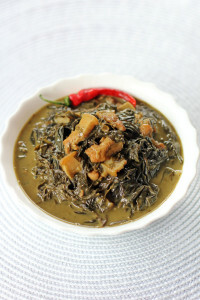 I’m also including links to recipes, I have not tried personally these recipes. I have picked them based on their ingredients, if they were close to what I personalty had. Don’t hate me too much if you try them and they are not good, just let me know and I will research further. 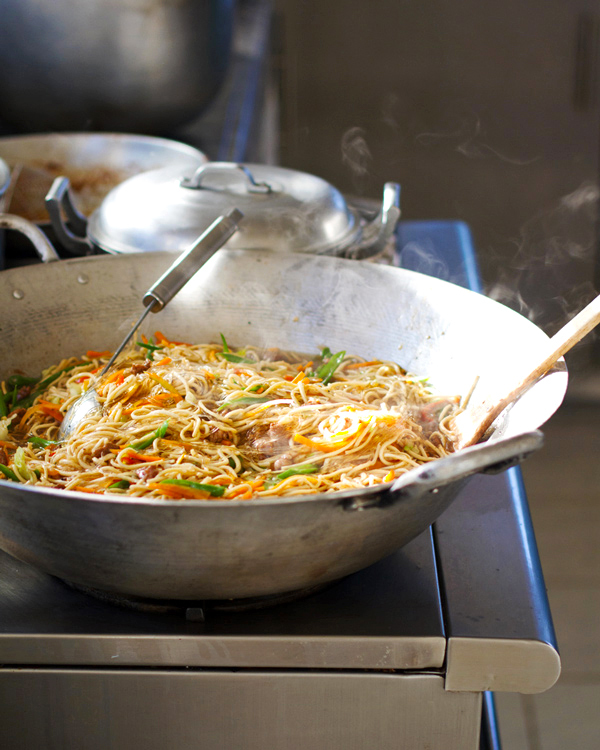 The version I had was made of noodles, oyster sauce, soy sauce, pork, green beans and bell peppers among other things. I didn’t know, but I did have this meal before. My father’s girlfriend is Filipino and made pansit for Christmas last December. Both times I had it, it was really good. You can find one recipe from the Food Network here and a simpler version here. 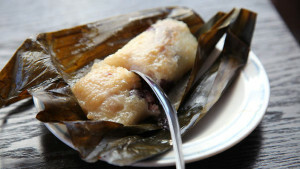 The version I had has sticky rice, coconut milk, sugar and spanish lemon. You can find another version here. This also I hadn’t realized I’ve had before, but it is now one of my favorite foods in the world! It’s sweet and gooey and oh so tasty! Balut is definitely one of the strangest thing I’ve had, and I have eaten bugs at a science museum if that says anything. 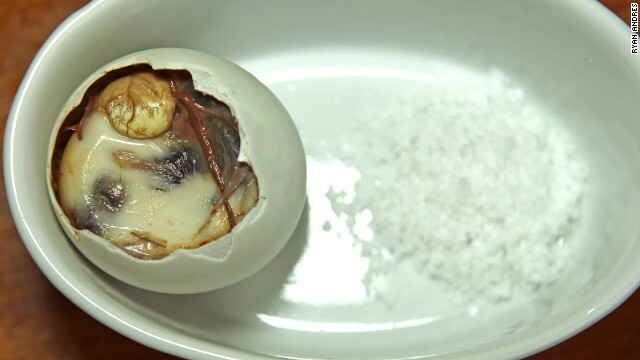 Balut is a Filipino delicacy, but even Filipinos are highly divided on this subject. It seems to be less popular in Manila and highly popular in Cebu. I can’t say much for the other regions. Balut is a fertilized chicken or duck egg that is boiled and then eaten. I had a beginner egg. Each egg is marked by a number, which represents the number of days since fertilization. My “beginner” egg was younger than others, which meant the chick inside was not as fully formed. In “advanced” eggs, chicks will even have their beak and wings. I found it difficult to eat, mainly because I cracked the wrong end. You should be cracking the pointy end. The way I was taught how to eat it is to crack the top, drop a bit of vinegar and salt, sip on the juice then knock back the chick and eat the yolk at the end. Some Filipinos only drink the liquid and don’t actually eat the chick. I’ve see reactions of travelers caught on tape, but I really didn’t think it was as bad as they made it seem. Sure, there was the taste of blood, but plenty of countries do eat blood (blood sausage in Ireland for example). I could think of many things that could be worst to eat, such as monkey brain when the monkey is still alive. My point is, you could do much worst. I hesitated when it came to putting a picture, but I think that I found a good compromise to show what it is without being too disgusting. I will admit this is not the prettiest dish on the block (although if you compare to balut, it is still a beauty queen), but I can attest to its deliciousness. The version I had comprised gabi leaves, coconut milk, ginger, onion, garlic, bell peppers, black pepper, soy sauce, salt and chicken (I was told I could use pork too). You can find another version here. This had a really interesting taste and I can’t wait to try to reproduce it at home. Now, those of you who know me well will know I am not a fan of my food looking back at me. You could consider it hypocritical, but I feel so guilty eating something that has the definite shape of an animal. This being said, lechon reminds me a lot of the mechoui my uncles do every summer. 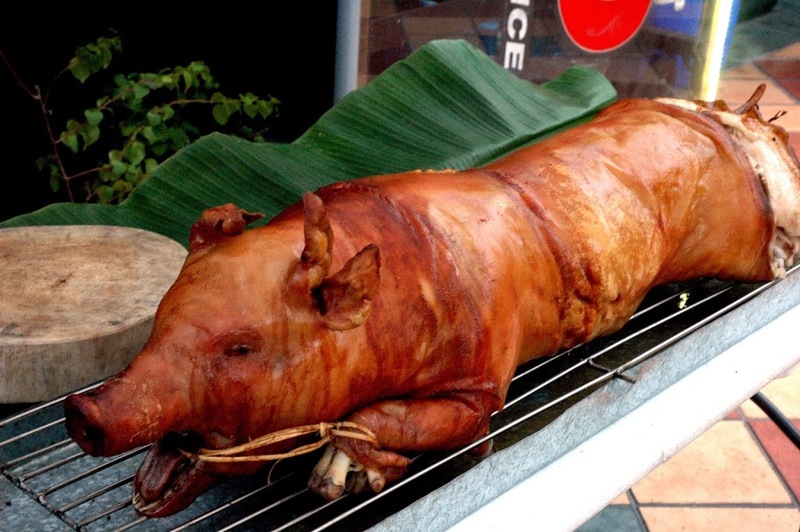 Lechon is a pig stuffed with hebs and spices which is then slowly roasted on an open fire. 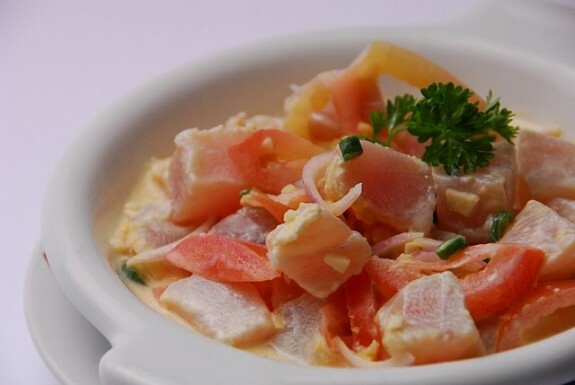 This seems like Filipino’s take on sashimi, it reminded me a lot of cheviche. It was raw fish cooked by the acidity of vinegar and made into a salad of sort. I could totally see myself eating this on a very hot summer day. 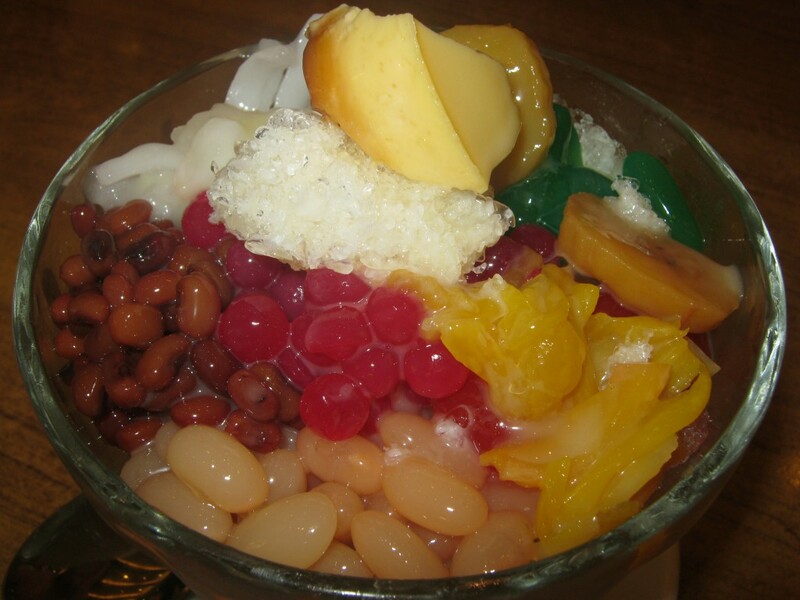 Halo-Halo is a mix of different things, starting with shredded ice and concentrated milk to which you can add sweet beans, fruits, jelly, etc. It’s sweet and cold, perfect for the hot climate of the Philippines. Might be a tiny bit too sweet for me though, if I make it at home I think I will reduce the amount of sugar involved. 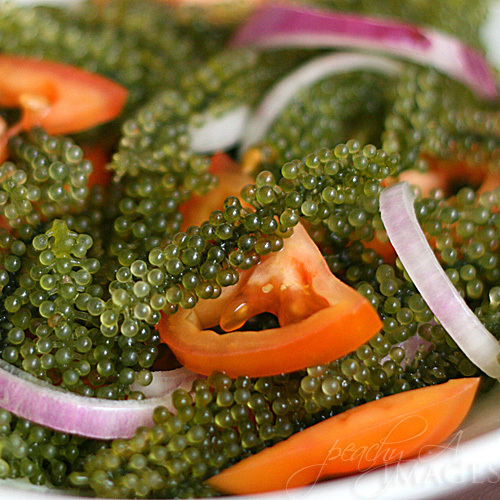 Lato, also known as sea grapes, is a type of seaweed. It is rinsed just before serving, because about 15 minutes after rinsing the water contained in each little bead leaks out and you and up with mushy seaweed instead of seaweed goodness. This is one of the things I wish we had in Canada, I would eat it all the time in summer. 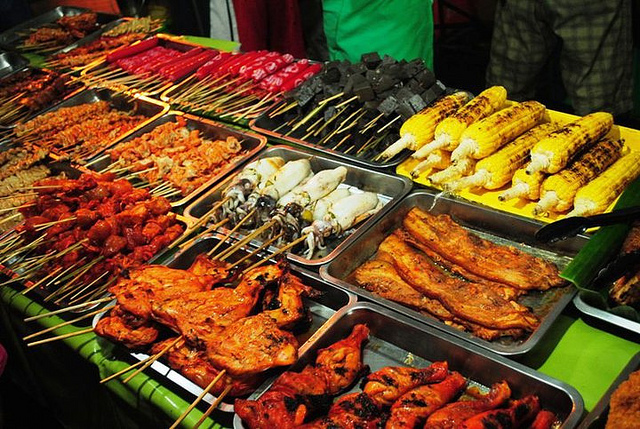 From chicken legs to chicken heads, feet and innards, even intestines, to sausages and different types of meats not so easily identified, Filipino’s streets are abundant with street fares. They were hit or miss sometimes, but I really liked trying new things. You can couple your food with carbonated drinks in a bag with a straw. Just make sure they are cooked right in front of you for bacteria control.